I wore this some time last week, but seeing as I’m such a sporadic blogger, I never got around to posting it. My mum bought me (and my twin sister!) this coat when we went shopping recently! It’s my Christmas present so don’t go thinking I’m spoilt, but it felt really nice to try something on without even thinking for a second that it could be mine, and being spoilt on the spot! Finally, a winter I won’t freeze through! I got this shirt a while ago but I forgot all about it, I really love it. It’s huge on me but I love the oversized, iliterallyjustthrewthison look it has. 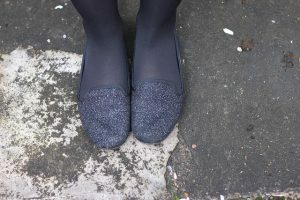 The shoes just add a little bit of sparkle a dull winter calls for! This sounds well silly I know but this outfit makes me feel like I’m a dead rich Hollywood film star – note the red lips ha! I think this will be one of my most worn combinations this winter. Is it Worth Switching from Glasses to Contact Lenses?